Looking for the perfect Christmas party? One with gorgeous food at a central location with entertainment that gets everyone involved? Then you’ve come to the right place. 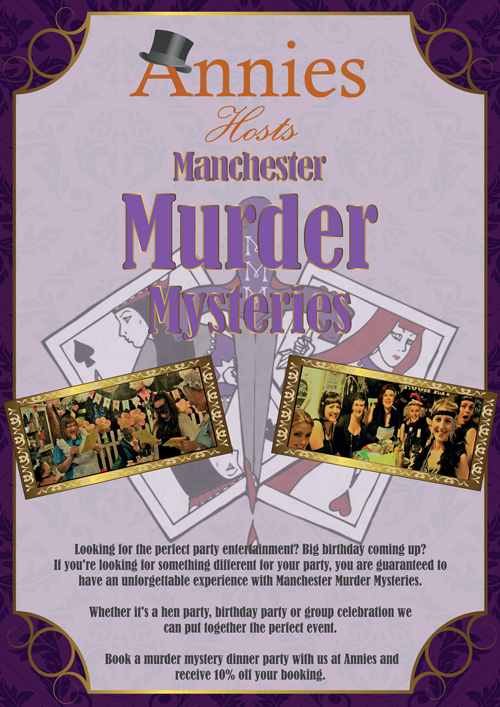 Manchester Murder Mysteries arrange and host modern and fun murder mystery parties for groups of colleagues, friends and family. Our fantastic themes, scandalous characters and hilarious plot lines promise an evening full of laughs. We only use high quality venues where you can rely on the service as well as the style. With our experienced party planning team and enthusiastic event hosts, we can organise for you a murder mystery dinner party for a Christmas night out to remember. 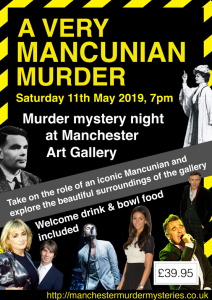 We work with a range of excellent venues in the city which would be happy to host you for a Christmas murder mystery party. Enjoy all the fun of the “who dunnit” exclusively for your team, friends or family. With a theme of your choosing, festive dining and exclusive venue hire, we can arrange a tailored Christmas party to remember. Click here to make an enquiry. We’re delighted to be retiring to Cosy Club Manchester for our big Christmas murder mystery party, Gin & Sin on Friday 7th December. 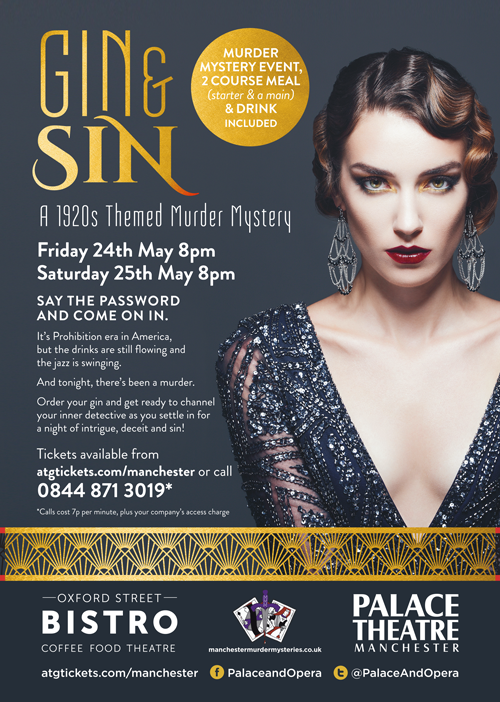 Delve into prohibition era America with this 1920s themed shindig, where you’ll meet the most ruthless gangsters and the deadliest flappers in town. 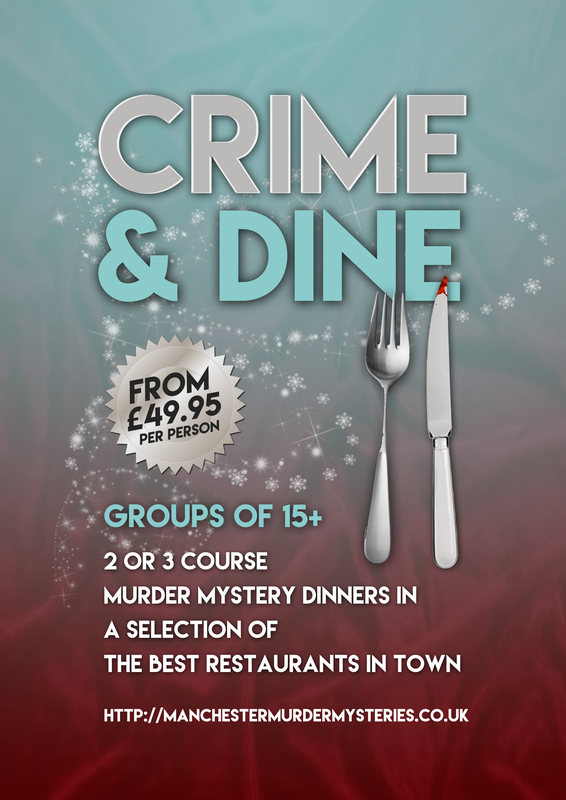 Guests will enjoy a fine three course festive dinner courtesy of the Cosy Club to accompany the murder mystery. If you’re looking for the ideal Christmas party, this could be it. Click here for tickets. Want to read the sparkling review we received from a Christmas 2017 client? Click here. Want to speak to us? Click here for our enquiry form and we’ll be happy to call you back.